As of 9:00 a.m. Wednesday morning, Hurricane Michael is churning in the Gulf of Mexico as a category 1. The latest predictions still show a potential category 3 storm upon impact in the Florida Panhandle between Apalachicola and Panama City. 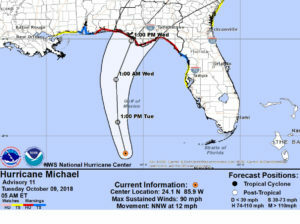 Upon making landfall, Michael is expected to turn northeast and make its way directly into southwest Georgia. This storm is a life threatening storm with the potential for winds to exceed 100 mph and brings with it a deadly storm surge. Additionally, rainfall amounts exceeding 6″ are expected in our immediate area. There is a National Weather Service briefing at 9:30 a.m. from which we hope to have more information. Other school systems in our area are expected to make an announcement after the next briefing. Decatur County is under a HURRICANE WARNING. Hurricane Michael is currently a CATEGORY 2 storm with a forecast for additional strengthening to a CATEGORY 3 by the time it reaches the coast by afternoon Tuesday, October 9th. Residents should closely monitor weather conditions. THIS IS AN EXTREME WIND THREAT FOR DECATUR COUNTY. Forecasts are for sustained Tropical Storm force winds 39-73 mph with wind gusts 80-100 mph. DO NOT TAKE THIS STORM LIGHTLY. WIND SPEEDS OF THIS MAGINTUDE CAN CAUSE SIGNIFICANT DAMAGE. Prepare for uprooted trees and downed power lines with power outages. Power outages could last for several hours or days. Unsecured buildings and unsecured lightweight objects should be anchored or tied down, including toys, trampolines, trash cans and outdoor furniture. Timing for this event for Decatur County is from before dawn Wednesday, October 10th through early Thursday, October 11th. Mandatory evacuations are not being made at this time; HOWEVER, RESIDENTS IN MOBILE HOMES ARE HIGHLY ENCOURAGED TO EVACUATE TO ALTERNATIVE SHELTER. Winds up to 50 mph can cause serious damage to mobile homes. Do not wait until the storm hits to seek shelter, then it is too late. Local shelters will not be opened due to Decatur County being in the path of the storm; however, if you have sheltering needs please contact Decatur County EMA at 229-248-3869 as early as possible to find out where Red Cross shelters are available. Shelters will not be opened in the hazard risk area due to being in harms way. At this time, we are awaiting confirmation from GEMA on the closest Red Cross Shelter.  For power outages, contact your power company. Do not call 911 for normal power outages. If you have a medical condition and need power, 911 can only dispatch you an ambulance if you are having difficulties related to your medical condition. Power outages may be widespread and could last several hours or days. Make sure you have additional medical supplies to last an extended period of time.  Sandbags are located at the Decatur County Correctional Institute on Airport Road and at 1503 Pierce Street.  As winds increase stay off the roads and inside a permanent structure. Roadways may be blocked and inaccessible. THE NATIONAL WEATHER SERVICE ADVISES: Hurricane Michael is forecast to be a major hurricane as it moves toward the northern Gulf coast. Decatur County is under a HURRICANE WARNING. Hurricane Michael is forecast to strengthen as it moves toward the northern Gulf coast, reaching major hurricane status by afternoon Tuesday, October 9th. Residents should closely monitor weather conditions. Wind: Prepare for DANGEROUS AND LIFE-THREATENING WIND having possible significant impacts across Southwest Georgia. Extended periods of Tropical Storm Force winds from 45-55 mph with gusts to 75 mph. Prepare for uprooted trees and downed power lines with power outages. Power outages could last for several hours or days. Unsecured buildings and unsecured lightweight objects should be anchored or tied down, including toys, trampolines, trash cans and outdoor furniture. Timing for this event for Decatur County is from before dawn to late evening Wednesday, October 10th. Mandatory evacuations are not being made at this time. Residents should make preparations to protect life and property. Residents in mobile homes are encouraged to seek alternative shelter. Winds up to 50 mph can cause serious damage to mobile homes. Do not wait until the storm hits to seek shelter, then it is to late. No local shelters have been opened due to Decatur County being in the hazard area of the storm; however, if you have sheltering needs please contact Decatur County EMA at 229-248-3869 as early as possible to find out where Red Cross shelters are available. Red Cross will not open shelters in the hazard risk area due to being in harms way. Shelters will be available in other non-impacted areas within the state. For power outages, contact your power company. Do not call 911 for normal power outages. If you have a medical condition and need power, 911 can only dispatch you an ambulance if you are having difficulties related to your medical condition. Power outages may be widespread and could last several hours or days. Sandbags are located at the Decatur County Correctional Institute on Airport Road for county residents, and at 1503 Pierce Street for City residents. As winds increase, if possible, stay off the roads and inside a reinforced building.